Using an easily understood approach combined with numerous worked examples, illustrations and homework problems, this textbook focuses on minimizing the mathematics needed to grasp radio frequency engineering. 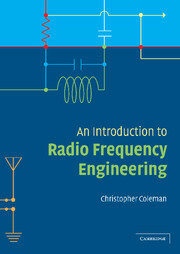 The book includes broad coverage of RF systems, circuit design, antennas, propagation and digital techniques. Written for upper level undergraduate courses, it will also provide an excellent introduction to the subject for graduate students, researchers and practicing engineers. 1. Basic concepts; 2. Frequency selective circuits and matching; 3. Active devices and amplifiers; 4. Mixers, modulators and demodulators; 5. Oscillators and phase locked loops; 6. Transmission lines and scattering matrices; 7. Power amplifiers; 8. Filters; 9. Electromagnetic waves; 10. Antennas; 11. Propagation; 12. Digital techniques in radio; Index.